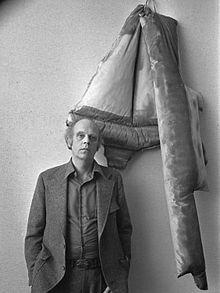 Claes Oldenburg was born on January 28, 1929 in Stockholm, the son of Gösta Oldenburg and his wife Sigrid Elisabeth née Lindforss. His father was then a Swedish diplomat stationed in New York and in 1936 was appointed Consul General of Sweden to Chicago where Oldenburg grew up, attending the Latin School of Chicago. He studied literature and art history at Yale University from 1946 to 1950, then returned to Chicago where he took classes at The School of the Art Institute of Chicago. While further developing his craft, he worked as a reporter at the City News Bureau of Chicago. He also opened his own studio and, in 1953, became a naturalized citizen of the United States. In 1956, he moved to New York, and for a time worked in the library of the Cooper Union Museum for the Arts of Decoration, where he also took the opportunity to learn more, on his own, about the history of art. By 1960 Oldenburg had produced sculptures containing simply rendered figures, letters and signs, inspired by the Lower East Side neighborhood where he lived, made out of materials such as cardboard, burlap, and newspapers; in 1961 he shifted his method, creating sculptures from chicken wire covered with plaster-soaked canvas and enamel paint, depicting everyday objects – articles of clothing and food items. Oldenburg's first show that included three-dimensional works, in May 1959, was at the Judson Gallery, at Judson Memorial Church on Washington Square. During this time, artist Robert Beauchamp described Oldenburg as "brilliant," due to the reaction that the pop artist brought to a "dull" abstract expressionist period. In the 1960s Oldenburg became associated with the pop art movement and created many so-called happenings, which were performance art related productions of that time. The name he gave to his own productions was "Ray Gun Theater". The cast of colleagues who appeared in his Performances included artists Lucas Samaras, Tom Wesselmann, Carolee Schneemann, Oyvind Fahlstrom and Richard Artschwager, dealer Annina Nosei, critic Barbara Rose, and screenwriter Rudy Wurlitzer. His first wife (1960–1970) Patty Mucha, who sewed many of his early soft sculptures, was a constant performer in his happenings. This brash, often humorous, approach to art was at great odds with the prevailing sensibility that, by its nature, art dealt with "profound" expressions or ideas. But Oldenburg's spirited art found first a niche then a great popularity that endures to this day. In December 1961, he rented a store on Manhattan's Lower East Side to house "The Store," a month-long installation he had first presented at the Martha Jackson Gallery in New York, stocked with sculptures roughly in the form of consumer goods. Oldenburg moved to Los Angeles in 1963 "because it was the most opposite thing to New York [he] could think of". That same year, he conceived AUT OBO DYS, performed in the parking lot of the American Institute of Aeronautics and Astronautics in December 1963. In 1965 he turned his attention to drawings and projects for imaginary outdoor monuments. Initially these monuments took the form of small collages such as a crayon image of a fat, fuzzy teddy bear looming over the grassy fields of New York's Central Park (1965) and Lipsticks in Piccadilly Circus, London (1966). In 1967, New York city cultural adviser Sam Green realized Oldenburg's first outdoor public monument; Placid Civic Monument took the form of a Conceptual performance/action behind the Metropolitan Museum of Art, New York, with a crew of gravediggers digging a 6-by-3-foot rectangular hole in the ground. In 1969, Oldenberg contributed a drawing to the Moon Museum. Geometric Mouse-Scale A, Black 1/6, also from 1969, was selected to be part of the Governor Nelson A. Rockefeller Empire State Plaza Art Collection in Albany, NY. From the early 1970s Oldenburg concentrated almost exclusively on public commissions. His first public work, Three-Way Plug came on commission from Oberlin College with a grant from the National Endowment for the Arts. His collaboration with Dutch/American writer and art historian Coosje van Bruggen dates from 1976. Their first collaboration came when Oldenburg was commissioned to rework Trowel I, a 1971 sculpture of an oversize garden tool, for the grounds of the Kröller-Müller Museum in Otterlo, the Netherlands. Oldenburg has officially signed all the work he has done since 1981 with both his own name and van Bruggen's. In 1988, the two created the iconic Spoonbridge and Cherry sculpture for the Walker Art Center in Minneapolis that remains a staple of the Minneapolis Sculpture Garden as well as a classic image of the city. Typewriter Eraser, Scale X (1999) is in the National Gallery of Art Sculpture Garden. Another well known construction is the Free Stamp in downtown Cleveland, Ohio. This Free Stamp has an energetic cult following. In addition to freestanding projects, they occasionally contributed to architectural projects, among them, two Los Angeles projects in collaboration with architect Frank Gehry: Toppling Ladder With Spilling Paint, which was installed at Loyola Law School in 1986, and Binoculars, Chiat/Day Building, completed in Venice in 1991;. The couple's collaboration with Gehry also involved a return to performance for Oldenburg when the trio presented Il Corso del Coltello, in Venice, Italy, in 1985; other characters were portrayed by Germano Celant and Pontus Hultén. "Coltello" is the source of Knife Ship, a large-scale sculpture that served as the central prop; it was later seen in Los Angeles in 1988 when Oldenburg, Van Bruggen and Gehry presented Coltello Recalled: Reflections on a Performance at the Japanese American Cultural & Community Center and the exhibition Props, Costumes and Designs for the Performance "Il Corso del Coltello" at Margo Leavin Gallery. In 2001, Oldenburg and van Bruggen created Dropped Cone, a huge inverted ice cream cone, on top of a shopping center in Cologne, Germany. Installed at the Pennsylvania Academy of the Fine Arts in 2011, Paint Torch is a towering 53 feet high pop sculpture of a paintbrush, capped with bristles that are illuminated at night. The sculpture is installed at a daring 60-degree angle, as if in the act of painting. Oldenburg's first one-man show in 1959, at the Judson Gallery in New York, had shown figurative drawings and papier-mâché sculptures. He was honored with a solo exhibition of his work at the Moderna Museet (organized by Pontus Hultén), in 1966; the Museum of Modern Art, New York, in 1969; London's Tate Gallery in 1970 (chronicled in a 1970 twin-projection documentary by James Scott called The Great Ice Cream Robbery); and with a retrospective organized by Germano Celant at the Solomon R. Guggenheim Museum, New York, in 1995 (travelling to the National Gallery of Art, Washington, D.C.; Museum of Contemporary Art, Los Angeles; Kunst- und Ausstellungshalle der Bundesrepublik Deutschland, Bonn; and Hayward Gallery, London). In 2002 the Whitney Museum of American Art in New York held a retrospective of the drawings of Oldenburg and Van Bruggen; the same year, the Metropolitan Museum of Art in New York exhibited a selection of their sculptures on the roof of the museum. Oldenburg is represented by The Pace Gallery in New York and Margo Leavin Gallery in Los Angeles. The city of Milan, Italy, commissioned the work known as Needle, Thread and Knot (Italian: Ago, filo e nodo) which is installed in the Piazzale Cadorna. In 1989, Oldenburg won the Wolf Prize in Arts. In 2000, he was awarded the National Medal of Arts. Oldenburg has also received honorary degrees from Oberlin College, Ohio, in 1970; Art Institute of Chicago, Illinois, in 1979; Bard College, New York, in 1995; and Royal College of Art, London, in 1996, as well as the following awards: Brandeis University Sculpture Award, 1971; Skowhegan Medal for Sculpture, 1972; Art Institute of Chicago, First Prize Sculpture Award, 72nd American Exhibition, 1976; Medal, American Institute of Architects, 1977; Wilhelm-Lehmbruck Prize for Sculpture, Duisburg, Germany, 1981; Brandeis University Creative Arts Award for Lifetime Artistic Achievement, The Jack I. and Lillian Poses Medal for Sculpture, 1993; Rolf Schock Foundation Prize, Stockholm, Sweden, 1995. He is a member of the American Academy and Institute of Arts and Letters since 1975 and the American Academy of Arts and Sciences since 1978. Oldenburg and Coosje van Bruggen have together received honorary degrees from California College of the Arts, San Francisco, California, in 1996; University of Teesside, Middlesbrough, England, in 1999; Nova Scotia College of Art and Design, Halifax, Nova Scotia, in 2005; the College for Creative Studies in Detroit, Michigan, in 2005, and the Pennsylvania Academy of Fine Arts, 2011. Awards of their collaboration include the Distinction in Sculpture, SculptureCenter, New York (1994); Nathaniel S. Saltonstall Award, Institute of Contemporary Art, Boston (1996); Partners in Education Award, Solomon R. Guggenheim Museum, New York (2002); and Medal Award, School of the Museum of Fine Arts, Boston (2004). In her 16-minute, 16mm film Manhattan Mouse Museum (2011), artist Tacita Dean captured Oldenburg in his studio as he gently handles and dusts the small objects that line his bookshelves. The film is less about the artist's iconography than the embedded intellectual process that allows him to transform everyday objects into remarkable sculptural forms. Patty Mucha was Oldenburg's first wife, from 1960 to 1970. She was a constant performer in Oldenburg's happenings and performed with The Druds. Between 1969 and 1977, Oldenburg was in a relationship with the feminist artist and sculptor, Hannah Wilke, who died in 1993. They shared several studios and traveled together, and Wilke often photographed him. Oldenburg and his second wife, Coosje van Bruggen, met in 1970 when Oldenburg's first major retrospective traveled to the Stedelijk Museum in Amsterdam, where van Bruggen was a curator. They were married in 1977. In 1992 Oldenburg and van Bruggen acquired Château de la Borde, a small Loire Valley chateau, whose music room gave them the idea of making a domestically sized collection. Van Bruggen and Oldenburg renovated the house, decorating it with modernist pieces by Le Corbusier, Charles and Ray Eames, Alvar Aalto, Frank Gehry, Eileen Gray. Van Bruggen died on January 10, 2009, from the effects of breast cancer. Oldenburg's brother, art historian Richard E. Oldenburg, was director of the Museum of Modern Art, New York, between 1972 and 1993, and later chairman of Sotheby's America. Oldenburg's sculpture Typewriter Eraser (1976), the third piece from an edition of three, was sold for $2.2 million at Christie's New York in 2009. Dropped Cone (2001) by Claes Oldenburg and Coosje van Bruggen. Situated on top of a shopping centre in the Neumarkt area of Cologne, Germany. Giant Balls (1977) by Claes Oldenburg and Coosje van Bruggen for Skulptur Projekte Münster, Münster. Pencil signature of Claes Oldenburg from 1991. Shuttlecocks by Claes Oldenburg and Coosje van Bruggen. South lawn of the Nelson-Atkins Museum of Art, Kansas City. ^ James O. Young (2001). "Art and Knowledge." New York: Routledge, p. 135. ^ "Gosta Oldenburg; Retired Diplomat, 98". The New York Times. April 1, 1992. Retrieved April 29, 2014. ^ Sigrid Oldenburg. "Sigrid Oldenburg". waatp.se. Retrieved April 29, 2014. ^ a b c Claes Oldenburg Archived May 10, 2012, at the Wayback Machine Guggenheim Collection. ^ "Claes Oldenburg." Encyclopedia of World Biography. Chicago: Fitzroy Dearborn, 1998; later: Gale. Retrieved via Biography in Context database, October 22, 2017. ^ a b c d e f g h Kristine McKenna (July 2, 1995), When Bigger Is Better: Claes Oldenburg has spent the past 35 years blowing up and redefining everyday objects, all in the name of getting art off its pedestal Los Angeles Times. ^ "Claes Oldenburg: On View, Apr 14 – Aug 5, 2013". Museum of Modern Art. moma.org. Sections "Introduction", The Street" and "The Store". Retrieved October 23, 2017. ^ Paul Cummings (1975). "Oral history interview with Robert Beauchamp, 1975 Jan. 16". Oral history interview. Archives of American Art. Retrieved June 30, 2011. ^ Christopher Knight (August 6, 1995), The Percolating Mind of Oldenburg : A retrospective shows how ideas from early in a career can cook for decades, before emerging to enshrine the mundane Los Angeles Times. ^ a b c Claes Oldenburg Museum of Modern Art, New York. ^ a b Johnson, Ellen H. (1971). Claes Oldenburg. Harmondsworth, Middlesex, England: Penguin Books. p. 46. ^ Duffes, Melissa. "Oldenburg's First Commissioned Public Sculpture Returns to AMAM". Oberlin College. Retrieved October 12, 2013. ^ a b Carol Kino (January 13, 2009), Coosje van Bruggen, Sculptor, Dies at 66 The New York Times. ^ Claes Oldenburg: Props, Costumes and Designs for the Performance "Il Corso del Coltello", January 9 – February 13, 1988 Margo Leavin Gallery, Los Angeles. ^ "Dropped Cone". Oldenburgvanbruggen.com. Retrieved April 29, 2014. ^ "Oldenburg's Paint Torch | 1805". Pafa.org. Retrieved April 29, 2014. ^ "Double vision: the joys of twin-projection cinema". British Film Institute. Retrieved December 1, 2015. ^ John Russell (March 6, 1995), Oldenburg Again: Whimsy and Latent Humanity The New York Times. ^ a b Oldenburg Biography Pennsylvania Academy of the Fine Arts, Philadelphia. ^ Tacita Dean: Five Americans, May 6 – July 1, 2012 Archived April 15, 2013, at Archive.today New Museum of Contemporary Art, New York. ^ a b Carol Kino (May 15, 2009), Going Softly Into a Parallel Universe The New York Times. ^ "Claes Oldenburg & Coosje van Bruggen: Biographies". OldenburgVanBruggen.com. Retrieved April 13, 2011. ^ Michael Peppiatt (April 2005), The Art of Inspiration – Claes Oldenburg and Coosje van Bruggen Engage the Unexpected in the Loire Valley Architectural Digest. ^ Carol Vogel (March 17, 1995), Modern's Ex-Chief Joins Sotheby's The New York Times. ^ Claes Oldenburg, Typewriter Eraser (1976) Christie's Post War with the Contemporary Evening Sale, April 20, 1969. Wikimedia Commons has media related to Claes Oldenburg.